Say the words “Georgia” and “president” in the same sentence and most people think Jimmy Carter. But in Meriwether County, those words, when spoken together, refer to New Yorker Franklin D. Roosevelt. Even now, some 60 years after his death, FDR’s legacy in Warm Springs, the town he adopted as his second home, draws some 100,000 people to Meriwether County each year. And while tourism is the established economic engine in the southern portion of the county, the northern end is anticipating industrial growth sparked by the Kia plant set to open in neighboring Troup County. Located in the town of Warm Springs, Roosevelt’s Little White House offers a glimpse into the president’s life. “This is where he felt like he could be himself,” Kim Cushman, site director of the state historic site, says about Roosevelt. The site occupies 160 wooded acres that were originally part of what is now the Roosevelt Warm Springs Institute for Rehabilitation. A new LEED certified (environmentally friendly) museum and the Little White House, the modest home Roosevelt built in 1932, are located on the property. The 11,000-square-foot museum features the hand-controlled car Roosevelt drove throughout Meri-wether County – badly, according to local lore – plus his collection of canes from around the world, personal and historic items belonging to the Roosevelts and the famous unfinished portrait that Roosevelt was sitting for the day he died. 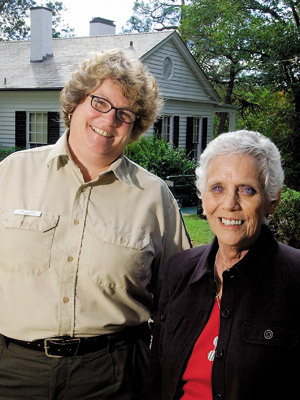 “We are the most-visited state historic site,” Cushman says, though she admits tourism numbers are falling, as they are at many sites around the country. To entice more visitors, the site is offering hands-on activities such as Dip into the Past, an opportunity for people to swim in the historic pools where Roosevelt and others sought what they hoped would be curative waters. Located at the adjacent Roosevelt Institute, the pools are no longer full of the 85-degree spring water Roosevelt enjoyed, due to the pools’ fragile structure. However, on Labor Day weekend, site personnel fill them with local mineral waters and open them to the public. Another project involving locals is collecting oral history. In his day, Roosevelt knew most of the people in the area, and remembered everyone’s name; but those who met him are aging and passing away. The museum is preserving people’s memories and stories about FDR and his time in Warm Springs. Not only can tourists see the home where Roosevelt lived, they can stay in the inn where the rich, famous and powerful stayed when visiting him. The Warm Springs Inn, now a bed and breakfast, was built in 1907 in downtown Warm Springs. Today’s guests can book rooms once occupied by the king and queen of Spain or Bette Davis. The ice cream parlor, where Roosevelt would buy ice cream for local children, is also still open. “Tourism is the number one industry in the county,” says Sabra McCullar, Meriwether County tourism director. And while FDR may be the big draw, other sites, including the National Fish Hatchery, along with shops and restaurants in 1800s-era buildings, bring people to the area as well. If funding can be found, the Eleanor Roosevelt School in Warm Springs will join the list of historic destinations. Built in 1937, it is the last of the 5,000 schools Julius Rosenwald, president and chairman of Sears, Roebuck and Co., built for African-American children across the Southeast and has been named to the Georgia Trust’s list of historic Places in Peril. The school is privately owned, but a group in the county is looking to buy it and turn it into a museum, perhaps set up as a Depression-era school, McCullar says. The downtown consists of historic buildings including the circa-1903 domed courthouse; the Methodist Church, which dates to the 1890s and houses Estes’ office; and the 1896 hanging jail. “We’re trying to get the jail on the Places in Peril list. It’s one of the missions of Greenville Better Hometown,” she adds. The organization is currently working on a streetscape project. “We want to be attractive and ready when the Kia growth comes,” she says. “That’s why the streetscape project has taken precedence.” The new Kia plant is expected to open in 2009 in neighboring Troup County. While tourism has been the past and is important to Meriwether’s future, other initiatives aimed at increasing the industrial and small-business presence also flourish. Meriwether also has recently been designated a Work Ready Community. “A local team has developed strategies to increase the high school graduation rate,” McKinley says. Gap training for individuals seeking to qualify for certain jobs will be available at no cost at West Georgia Technical College’s Meriwether County Workforce Development Center. “As a rural county with a high unemployment rate and relatively low high school graduation rates, it is important for us to forge this collaborative initiative designed to prepare all our citizens for the competitive jobs our economic developers are working so aggressively to bring into our county,” McKinley says. The region is concentrating on the advanced manufacturing industry in order to provide trained employees for the anticipated influx of suppliers that will follow Kia. To welcome suppliers, the finishing touches are being put on the new Meriwether Industrial Park located at I-85 and Highway 54. The 900-acre park, a public-private partnership, “allowed us to go after some Kia suppliers,” says Meriwether County Development Authority President Kip Purvis. “It’s a race to provide the infrastructure.” Not a race among the West Georgia counties competing for supplier business, he insists, but a race to get the park completed before it’s too late. Supplier industry executives find the location between the Kia plant and Atlanta’s Hartsfield-Jackson International Airport to be very attractive. The 240-acre Greenville Indus-trial Park, conveniently located next to the Workforce Development Center, also is near completion. “We think it will be a huge boon for the city of Greenville in the long run,” Purvis says. While much of Meriwether’s growth is expected to occur on the north end of the county, thanks to I-85, Kia and the sprawl from Atlanta, G&S Metals chose the Manchester Industrial Park, located in the southern part of the county, for its first Southeastern facility. G&S, which opened in 2006, expects to have 75 employees and invest $7 million in the project by 2009. The company, headquartered in Indiana, supplies the automotive industry and related industries with primary-grade recycled aluminum. Some of that expense will be handled by a Special Purpose Local Option Sales Tax (SPLOST), which passed in September. Part of the money will be used to pay for extensive water work in the north end of the county, Purvis says. From historic sites in the south to industries in the north, Meriwether County’s leaders are rolling out the welcome mat to newcomers, while touting the benefits of growth to locals.